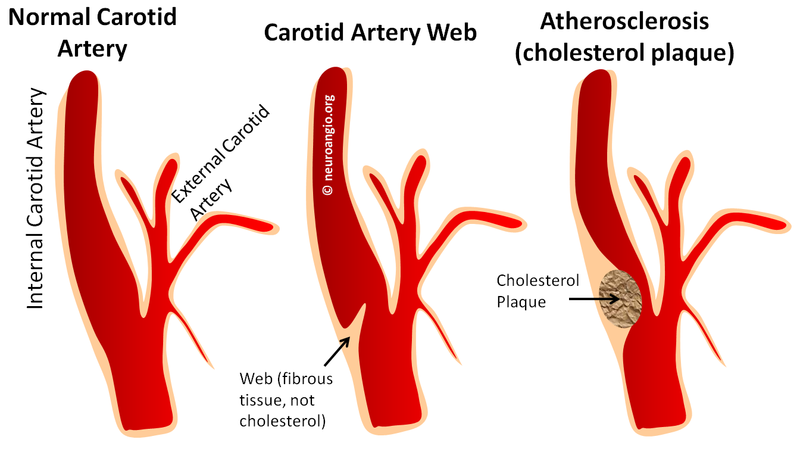 The Web is a shelf-like protrusion of what is likely connective / fibrous tissue into the vessel lumen — typically the very proximal internal carotid artery, at the bulb. 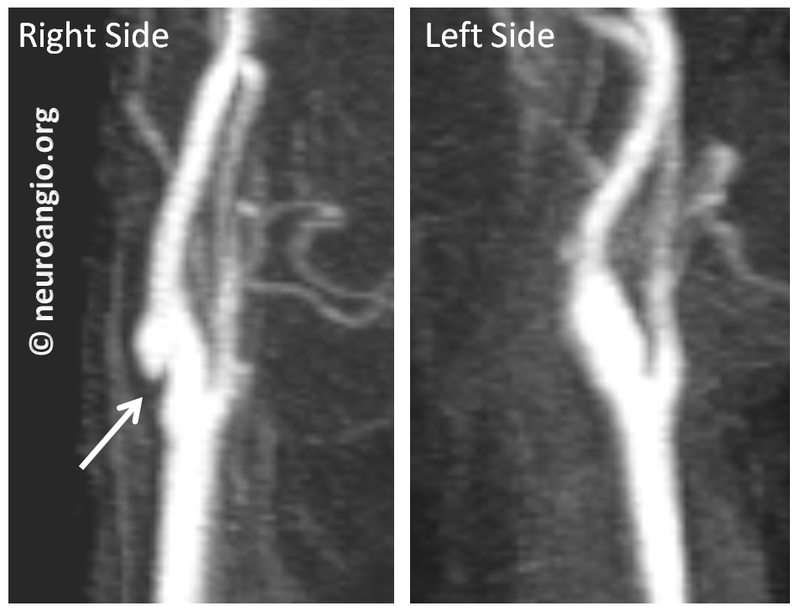 Some feel this to be a variant of Fibromuscular Dysplasia. Most seem to be asymptomatic. A spectrum exists, of course, from small to prominent webs. The latter cause progressively greater stasis of blood flow beyond the web, like a dam. 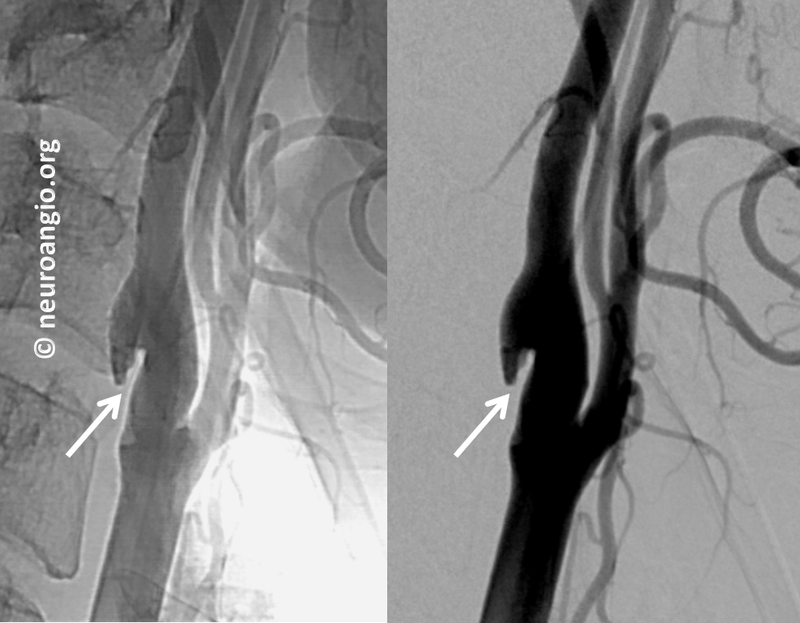 Cases of embolic stroke with no other identifiable risk factor are felt to be due to clot formation at the site of stasis, with secondary embolization. The author believes in this theory. The reason for so many adjectives of uncertainty here is that worldwide experience is quite limited. There is an opinion that antiplatelets do not offer much protection, as the underlying cause is stasis — a la. atrial fibrillation. 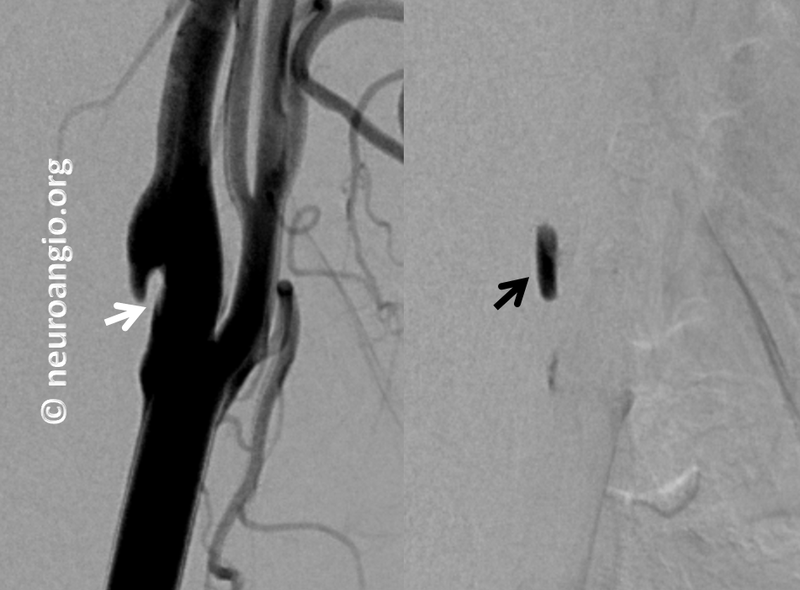 Some practitioners will stent cases presenting with recurrent stroke despite medical management. Randomized, controlled, etc. data is nonexistent, but this treatment seems to make sense. Case 2 — Asymptomatic, multimodality imaging. This person had the web, initially misdiagnosed as a dissection, followed by every imaging modality available. 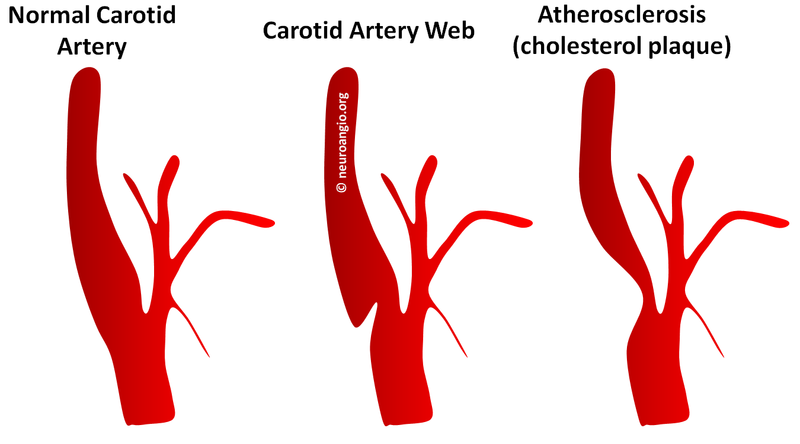 It is a nice illustration of what a web looks like on Ultrasound, CTA, MRA (contrast and noncontrast) and finally catheter angio. This is not a dissection and not a plaque. Management is with a baby aspirin since there is no history of stroke. Basically, they all look about the same. 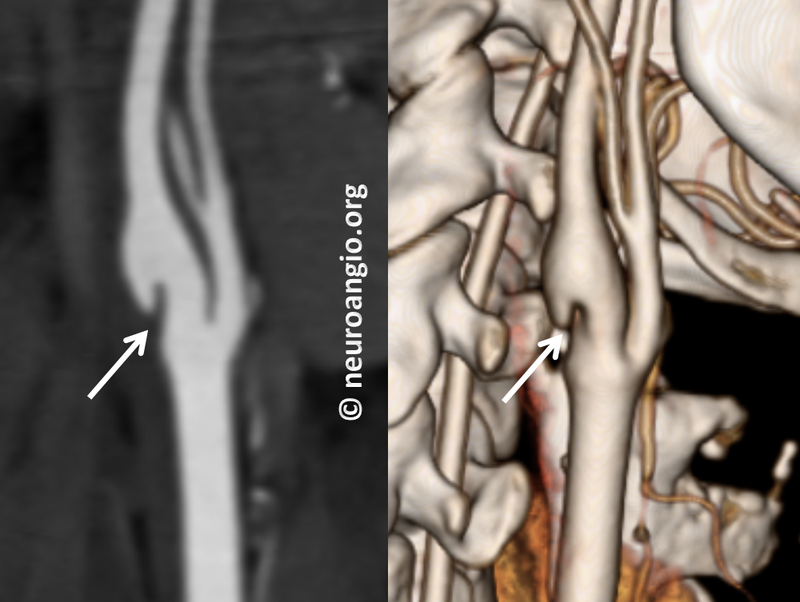 A wedge-like, longer than wide, triangular-shaped protrusion into the ICA from the back (dorsal aspect) of the carotid bulb. 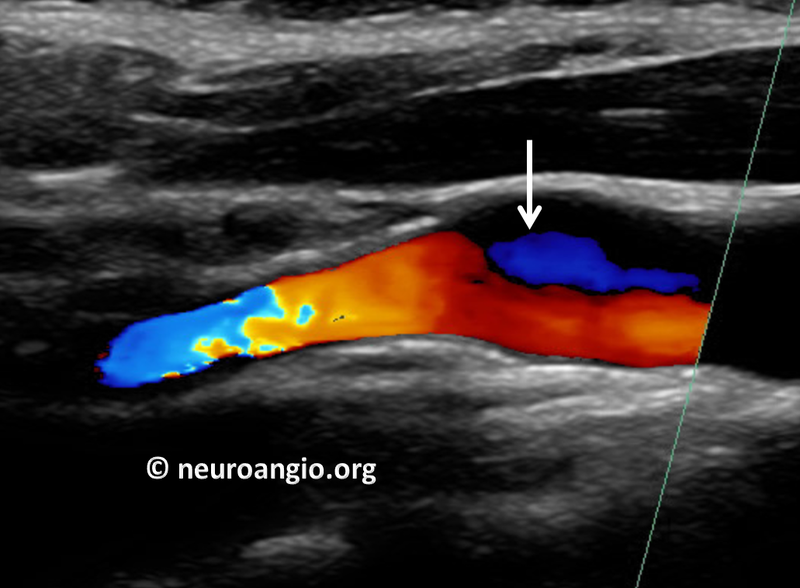 Most are associated with contrast stasis at the back part of the vessel in venous phase. 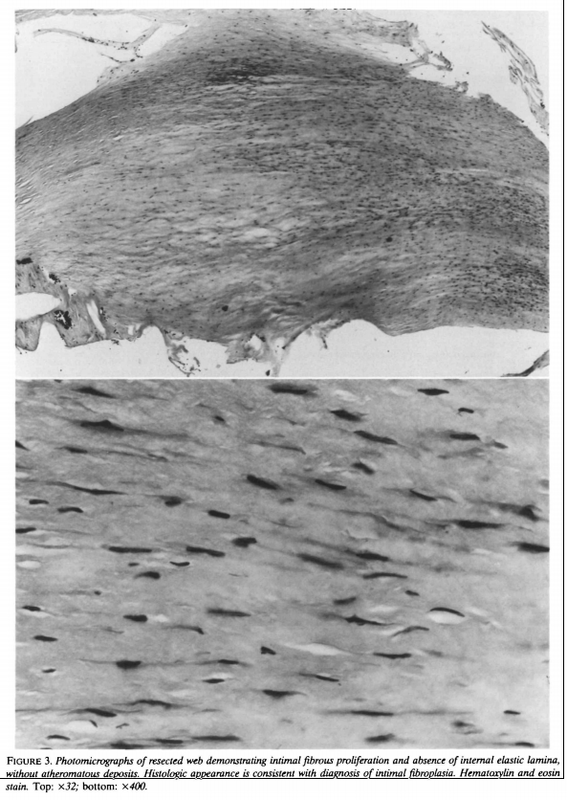 Below is an H&E histology section of the Web from Morgenlander and Golstein, diagnosing it as Intimal Fibroplasia rather than atheromatous lesion.